I highly recommend you this hostel! It is located in the amazing area of Dongsi where they still are preserved hutongs, very cute coffee places and delicious restaurants! The hostel itself is a traditional hutong with a cute little courtyard! The staff was super friendly and so helpful, they even helped us booking our train for our next destination, they are lovely people! We were upgraded to the double room and it was really one of the best hostel experience we had from all our trip to China! Tout était très bien. Formidable acceuil. 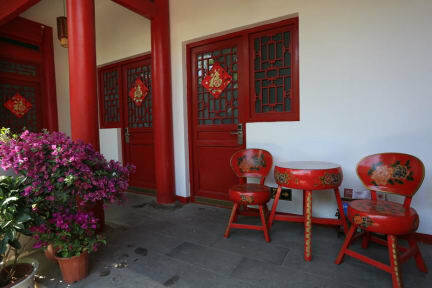 Very well located in a charming hutong house. The owner has been extremely helpful with for helping us arrange the next days of our trip. Thank you again ! Compliqué à trouver mais endroit très chaleureux ! Aside from its excellent location (main entry on dongsi 3 tiao, three streets up when exiting Dongsi metro station - exit B) in a central but quiet area not far from Beijing's major attractions, this pleasant hostel offers a nice environment for international travellers as it is also frequented by Chinese students and staff (especially manager Linda and young clerks Aisha and Brian) is extremely friendly and helpful​. Problem : 4-bed dormitories are narrow and shower rooms are inconvenient. A cozy place in a traditionnal hutong. The hostel is nicely located (in the city center) right next to Dongsi metro station. However, the staff couldn't care less and weren't really helpful of anything. There is no ambiance at all (90% of the hostel were Chinese who couldn't speak english and stayed in their room). Maybe it was because of the low season? Also, the price isn't cheap (mid-range), and while it's supposed to offer food, during my 4-days stay none was availaible for some reason.